Riot Kayaks - Now Available ! A stable touring kayak with a ton of gear room forward and rear dry storage hatches will swallow all the kit you could possibly need for a day or two on the water. Longer and more slender than the Enduro 12. With its fast hull design and Track-Rite skeg system this touring boat will really help you go the distance. 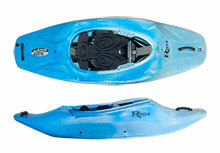 The latest offering from Riot Kayaks, a truly versatile kayak to suit a variety of water conditions. Suitable for inland touring and coastal exploration. The award winning and accessible Brittany is perfect for beginners and experts alike. Riots most successful white-water boat. With a fantastic volume distribution and full white-water outfitting. Overall, the Magnum is a great UK white-water kayak. A well balanced, classic Playboat from Riot. Featuring the iconic spider web hull pattern. A reliable and stable river runner, shaped to effortlessly manoeuvre down river while versatile enough to surf all day long. A great all rounder.